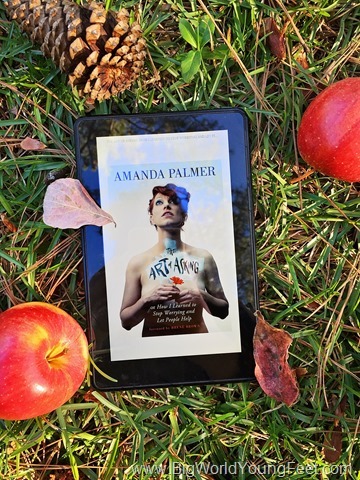 The Art of Asking is part autobiography, part manifesto, all Amanda Palmer. I came to love Amanda Palmer years ago through a couple of burned CDs of her band, The Dresden Dolls. I wore those Sharpied Memorexes out during college, blasting the music far too loudly. Much later, in 2013, Palmer gave a TED talk called “The Art of Asking,” and the book follows, loosely, the outline of that speech. If you haven’t seen it, it’s a really good one. Watch it here. Out of college, Palmer worked as a street statue. Dressed as a bride, face painted white, when people put money in her hat, she gave them a flower. Working this job taught her about person-to-person exchange, and she longed to carry this sense of direct relationship into her music. Her earliest gigs were built on the model of “passing the hat,” and her shows today are built in no small part on couchsurfing and requests on Twitter for anything and everything. If you don’t who Amanda Palmer is, you might have heard of her record-breaking Kickstarter project, which raised over 1.2 million dollars to fund an album for her band, Amanda Palmer & The Grand Theft Orchestra. She came under some criticism for this Kickstarter, but Palmer is continuing the “asking” model by funding her projects on Patreon, another crowdfunding site that allows fans to pay artists on a monthly basis or once per “thing” released. She’s sticking with the art of asking. The message of The Art of Asking is that by learning to ask for things, we open ourselves up to deeper relationships and more beautiful outcomes than ever imagined. It’s less a “how-to” and more of a story of how it’s worked for her. It feels a lot like Brene Brown’s work on vulnerability, and Dr. Brown even wrote The Art of Asking’s prologue. To Palmer, asking and art are inseparable. “Asking is, at its core, a collaboration,” writes Palmer, “Those who can ask without shame are viewing themselves in collaboration with—rather than in competition with—the world.” You can’t be an artist—of any kind—without learning to ask without shame. And even if you don’t consider yourself an artist, chances are your life and relationships can be enriched simply by learning to ask for things. Asking, for me, is hard. I fear seeming too forward, I fear seeming like I can’t provide for myself. I fear seeming incapable or weak. So when Palmer wrote the following passage, I felt like she was speaking it directly to me (in fact, I wish I could have her read this passage to me on my voicemail so I could play it throughout the day as needed)”: “It isn’t so much the act of asking that paralyzes us—it’s what lies beneath: the fear of being vulnerable, the fear of rejection, the fear of looking needy or weak. The fear of being seen as a burdensome member of the community instead of a productive one. It points, fundamentally, to our separation from one another.” And clearly, we are better as a culture, as a world, when we feel that we belong to each other. In asking we give someone else the opportunity to put their skills or gifts to use; we allow another person to give a part of themselves to us. Later it can be our turn. In the book, Palmer tells of something that would happen sometimes when she was the 8-foot Bride: someone would drop money in the hat, she’d give them a flower. They’d give the flower back, or someone would bring her a bouquet of flowers. There would be so much giving back and forth that it was hard to tell how it had all gotten started or what originally belonged to whom. What a beautiful image—a world so full of asking and giving that it all becomes a beautiful mess of companionship. The Art of Asking releases today in paperback.